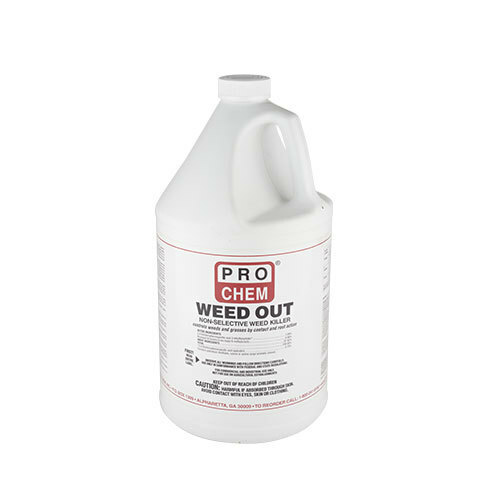 WEED OUT | Pro Chem, Inc.
WEED OUT is a ready-to-use, solvent-based, non-selective weed killer. It contains two active ingredients that provide double the killing power. Bromacil controls weeds through root contact and gives season-long residual control. 2,4-D controls weeds through foliage and gives immediate weed burn-down. This product is particularly effective in areas where undesirable vegetation is tall and well established. 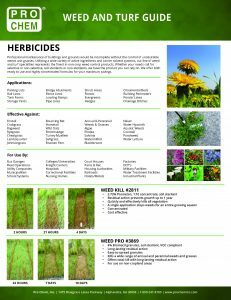 WEED OUT is designed to be applied undiluted as a spray on non-cropland areas where bare ground is desired. See label for detailed instructions. To control most weeds for an extended period of time on non-cropland areas, such as parking lots, fence rows, loading ramps, railroad sidings, storage yards, around buildings and industrial plant sites, apply 0.9 gallons per 1,000 sq. ft. (39 gallons per acre).